Halloween is this Saturday, October 31st! * Have an arrangement created in a short glass cylinder, which can then be tucked into a plastic trick-or-treat pumpkin, a plastic cauldron or even a fresh pumpkin. 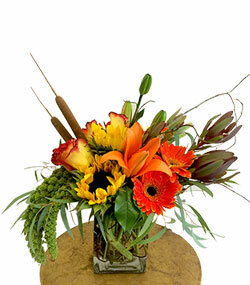 Makes a fantastic, eye-catching centerpiece! * Another spooky centerpiece is to use white flowers in a black container, but take it from elegant to evil by affixing little fake black insects such as ants or cockroaches (usually available at the local dollar store) all over the flowers. Yikes! *Curly willow branches spray-painted black can be tucked into houseplants or placed in a tall container, creating a wonderful silhouette. * Spanish moss looks creepy, with its wispy tendrils draping down. Hang it off plants, corners of shelves, and places unexpected. Spoooooky! * If you're hosting a Dia De Los Muertos party, don't forget the marigolds! These brilliant orangey-yellow flowers are favored by Mexicans for the Day of the Dead celebrations, with the flower indicating the fragility of life. * And for those who will be sporting sugar skulls (those creepy grinning colorful painted faces), a blooming rose is necessary to complete the look. Purchase a few roses earlier in the week, leave in a vase for a couple days at room temperature to open, then choose the most-bloomed flower to tuck behind your ear to complete the look. *Here's looking at you. . . Use either spider mums or gerbera daisies for this fun quick craft: purchase googly eyes at the local craft store, then affix to flowers. Tiny eyes look great on spider mums, while a single, big eyeball is hysterical peering out from the center of a gerbera daisy. Most of these eyes have a glued backing, but a drop of craft glue helps to keep it firmly in place. *Halloween colors have traditionally been black and orange, but in recent years, dark purple and acid green have joined the ranks. The best flowers for Halloween colors? Bosses Day has been around since the late 1950s, created by an Illinois woman who--quite coincidentally, we're sure--had a boss who also happened to be her father. She thought all bosses needed a day of recognition, and then-Governor Otto Kerner agreed, passing a bill that recognized a day for bosses, back in 1962. However, Hallmark did not start offering Boss's Day cards until 1979, and surprisingly, the holiday really didn't take off until just recently in 2007, when it made an almost 30% jump in popularity. 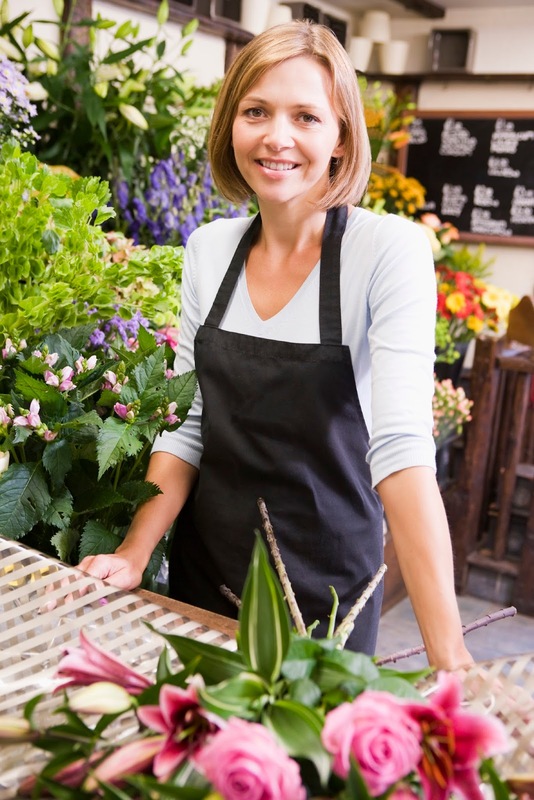 What to send to your boss to let him or her know you appreciate everything they do for you? How about bright flowers to adorn their desk? Something like our Autumn Essence (CFE512) offers a bright pop of color and will make your boss think about that raise she's been considering for you, every time she looks at it. For something a little more masculine, the Garden Of Zen (CFE369) looks great in any office, and the succulent plants are both low maintenance and trendy. Shop here. For all the things your boss does for you. . .lets you take emergency days, no questions asked . . . looks the other way when you're occasionally a few minutes late. . . thanks you for all the times you make him look good. . . realizes that every now and again, you want to leave early to catch your son's soccer game or daughter's ballet recital. . . makes a small deal out of your mistakes and a big deal out of your triumphs. . . helps to get the job done. . . manages effectively. . . uses humor, humility and empathy in everything he does. . .
Yeah. All great reasons to recognize the big guy (or gal!) on Boss's Day, October 16th! A large percentage of these visitors hail from Alberta, Manitoba, Saskatchewan, British Columbia and Ontario. If you've got Canadian friends who roost in the valley during the winter, surprise them with a fall bouquet or centerpiece for Canadian Thanksgiving, which falls on October 12th this year. Much like the US Thanksgiving, it is a day of thankfulness for the harvest, for the bounties of the year. So of course, there is a huge meal (which is much like what we have here with the '3 T's: Turkey, Taters and Too much of everything else). If you are at all lucky, you'll be invited to this festivity. Then next month, you can invite them to your big shindig on Thanksgiving Day (November 26th) and compare notes!